Films like The Voices make me glad I don't work in marketing. I mean where do you even start? Here's a film which swerves between awkward comedy and savage horror with wild abandon, whose cast screams "Average Romcom!" at the top of its voice, but whose script dares to address issues surrounding mental illness in a way that would send most mainstream directors running for the hills. How you sell that to a general moviegoing public, most of whom come out in hives if a film can't be described with fewer than two words and a generic poster, is quite beyond me. So spare a thought for the poor souls at distributors Arrow Films, whose job I shall attempt to make easier by suggesting you forget about genre conventions and just watch The Voices with an open mind and a chum to pop your jaw shut during the end credits. Ryan Rodney Reynolds, far more convincing here as a factory packing monkey than he ever was as an action hero, plays Jerry, a simple guy who - heh - has conversations with his pets and - lol - is a bit awkward around girls. Then, at the insistence of his - haha - cute ginger cat, who - pffft - has a Scottish accent, he REPEATEDLY AND BRUTALLY STABS SOMEONE IN THE CHEST UNTIL THEY ARE DEAD. To suggest that the film's tone has shifted somewhat is an intergalactic understatement. Yet back and forth it goes, playing off Jerry's fumbling relationships with Gemma Arterton and Anna Kendrick against his reluctant descent into serial killer territory. It is, frankly, fascinating to be tossed around in your seat like this by Michael R Perry's mad script and Marjane Satrapi's direction: she steers the film with the assured nature of a captain taking her ship through a superstorm against the advice of everyone around her. Through all the guiltily chucklesome mayhem (beautifully shot by Maxime Alexandre), we're asked to examine Jerry's mental health via a series of conversations with his psychiatrist (Jacki Weaver), his dog Bosco and his cat Mr Whiskers. Jerry's on medication to "smooth everything off", but this leads to an only-too-real world intruding on the idyllic existence he's built from his own state of mind. Before long you might actually find yourself questioning the very concept of reality, and whether one person's is any less valid than another's just because the chemicals in their brain are out of whack. Of course, when you're talking about serial killers, questions of mental illness rub up against the notion of pure evil, the old nature vs nurture debate is rolled out and hang on are we still talking about a Ryan Reynolds film? What's notable about The Voices is that none of this is rammed down your throat, but nor is it treated remotely frivolously despite repeated comedic interludes. Satrapi, director of the remarkable Persepolis, is no stranger to Movies With Issues, and though her latest may be tonally all over the place it's a controlled experiment. Both she and writer Perry know they can't hope to address all the complexities of mental illness, so they use serial killing as a metaphor for just about any level of internalised struggle or moment of self-doubt and comedy to sweeten the pill, delivering a film as schizophrenic and likeable as its lead character. Reynolds employs every ounce of his not inconsiderable charm to keep you on Jerry's side, Gemma Arterton has fun with her posh British totty role and Anna Kendrick is predictably and effortlessly great, but Satrapi is the star here, crafting refreshingly intelligent and original cinema. 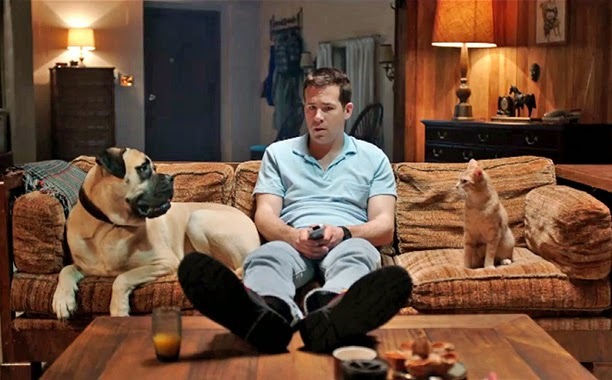 The Voices is an unexpectedly gleeful delight: bold and independent, with a wilful disregard for mass appeal. It might freak a few people out - and I'll be honest, I've no idea how anyone who suffers from depression or worse might receive it - but it's got rhino-sized balls, and these days that's rarer than a decent Ryan Reynolds film. It's the Spectre teasre trailre!